13 Reasons Why an Introvert Marriage Is a Blast! Boy, was he right! Neither of us is a naturally outgoing person. So we really have to force ourselves out of the house, lest we wind up a pair recluses, forever chained to the living room. But there’s also a lot to love about an introvert marriage that I never realized before I got hitched. I was mulling this over last night and couldn’t resist sharing with you. Feast your eyes on 13 reasons why an introvert marriage is a blast! Neither my wife nor I am a big fan of small talk. We prefer to go deep and get to know a few people really well. This past year, we’ve really enjoyed having one friend at a time over for dinner. We take turns asking him questions and finding out what he’s learning, enjoying, fighting, and so forth. 2. We guard our calendar. We value a balanced calendar, so we intentionally keep our weekends relatively free. That way we’re not always on the go. Neither one of us constantly drags the other out to social events, which is great, most of the time. 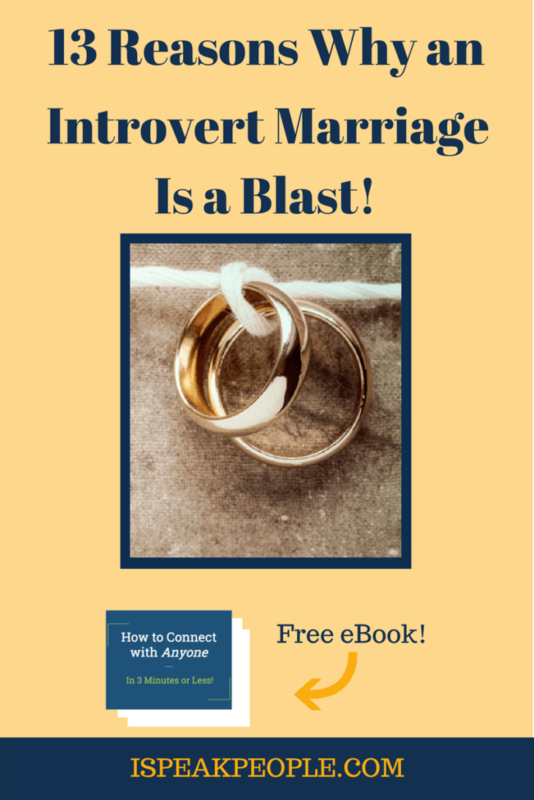 Burnout resulting from overactivity is seldom a problem in our introvert marriage. Our “fun” usually entails working on individual projects. I write, and she sews. It’s not uncommon for either of us to spend two to five hours straight on a project. We savor the alone time and seeing our creative ideas take shape. 4. We thrive in the zone. Part of the reason we love projects so much is that we thrive in the zone. “The zone” is that laser-focused state that results from a half hour to an hour of uninterrupted work. When an introvert shuts out distractions and zeros in on a task, he can knock out quality work like gangbusters. It’s a great place to be. 5. We define “good time” the same way. An ideal Friday night is one where we relax at home, preferably with a book. While we like to get out of the house from time to time, we prefer to lay low after a long week so that we can decompress. Then, if we’re feeling up to it, we venture outside – but not until Saturday. 6. We understand the need for silence. We need quiet and rest to recharge each day. So when one of us slips away to another room for privacy, the other understands. Sometimes, we even just sit quietly in each other’s presence. 7. We give each other time to think. 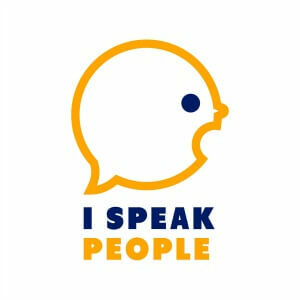 When we’re engaged in conversation, we give one another time to think before speaking (most of the time…). There’s no need to fight for a turn. More often than not, we need someone to say a few more words. 8. We tend to listen. It’s easy to let another person think when you prefer to listen. And listening comes naturally for both of us. That’s a real plus when one of us needs a sounding board or a sympathetic ear. Neither is ever far away. 9. We like to reflect. We’re wired for introspection, it’s true. We automatically replay each day’s events in our heads, analyzing (or overanalyzing) and interpreting them. We know we both do this, so we’re happy to provide each other with other perspectives when we need them most. As introverts, we open up slowly and cautiously. Few people know us really well. The beauty of being married to an introvert is that we see sides of each other that no one else will ever see or know. Thus, we share a special bond of intimacy. 11. We have a few deep interests. In the few years that we’ve been married, my wife and I have come to understand how important each other’s interests are. My wife enjoys sewing and crafting, and I enjoy writing and music. When one of us wants to invest time and money in a project, the other is generally supportive because we know how energizing a passion can be. While this may not be the case for every introvert, it’s definitely true of my wife and I. We love learning. Some of our best times together have been spent watching documentaries, reading books, or attending classes. For us, researching a mutually interesting topic equals fun. 13. Creation speaks to us. We’re lucky to live alongside a rail trail; we use it all the time. We relish the oaks, maples, and tulip poplars, the daffodils and daisies, and the sunrises and sunsets. There’s nothing like a quiet walk together through God’s glorious creation. What do you love about your introvert marriage? Add to the discussion!